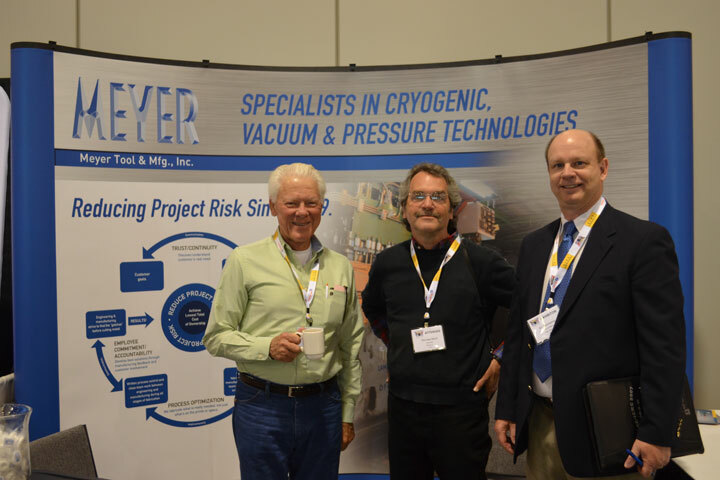 Meyer Tool Exhibits at the 2013 CEC - Meyer Tool & Mfg. Anchorage, Alaska was a spectacular backdrop for the 2013 Cryogenic Engineering Conference (CEC). 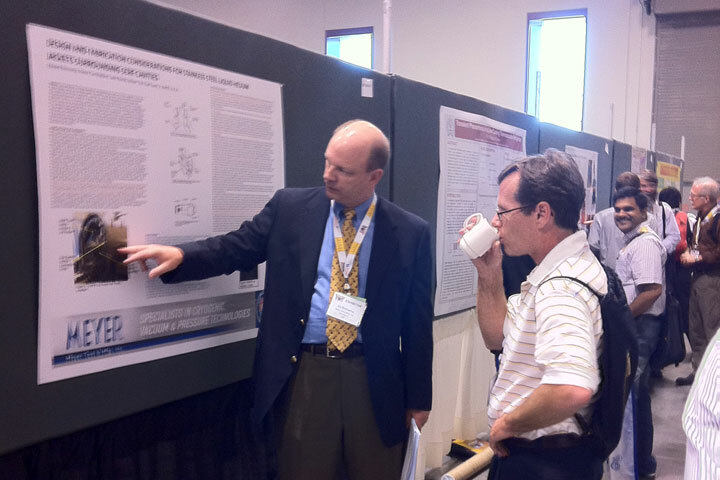 This bi-annual conference prides itself on featuring the latest research and developments in cryogenic areas including superconductivity, cryocoolers, cryogenic materials, and applications. There are plenary sessions and short courses to facilitate the exchange of knowledge. 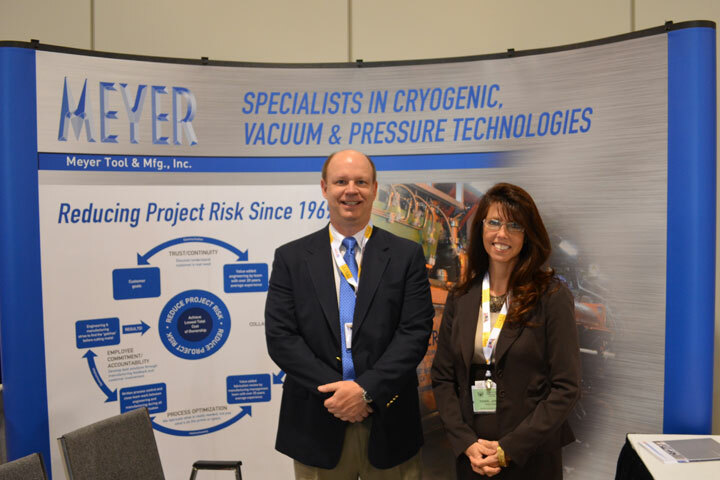 Meyer Tool & Mfg., Inc., one of the approximately 37 exhibitors, was represented by Eileen Cunningham, President, and Ed Bonnema, VP Engineering and Sales. Despite an atmosphere of uncertain budgets and challenging economic times, the CEC, as always, provided the opportunity to mingle with peers, share ideas and catch up on projects status, activities, and timelines. 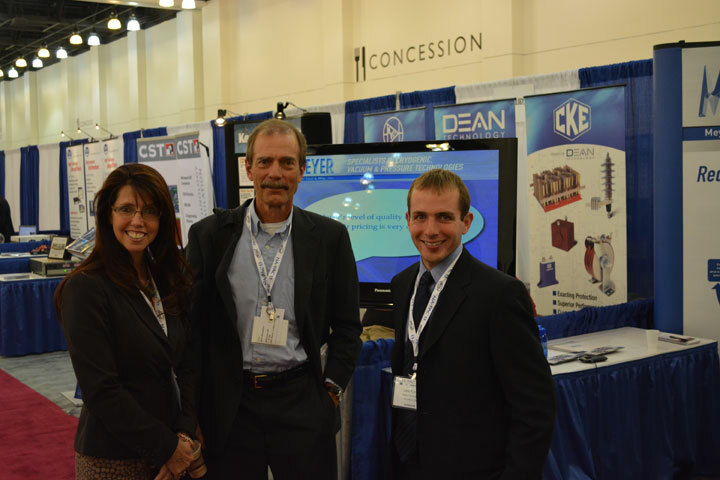 Meyer Tool appreciates the great interactions between suppliers and end users during and outside the exhibit hall. 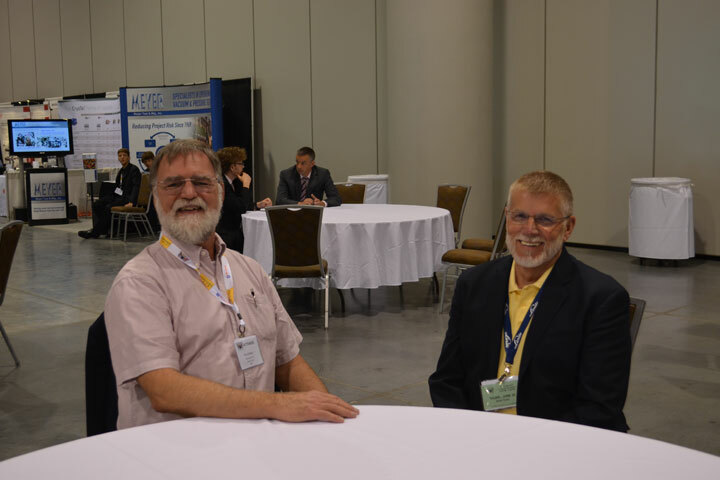 Many of the attendees and exhibitors have been coming to the conference for decades, and, as always, it was a pleasure to catch up with our CEC-ICMC friends and colleagues. 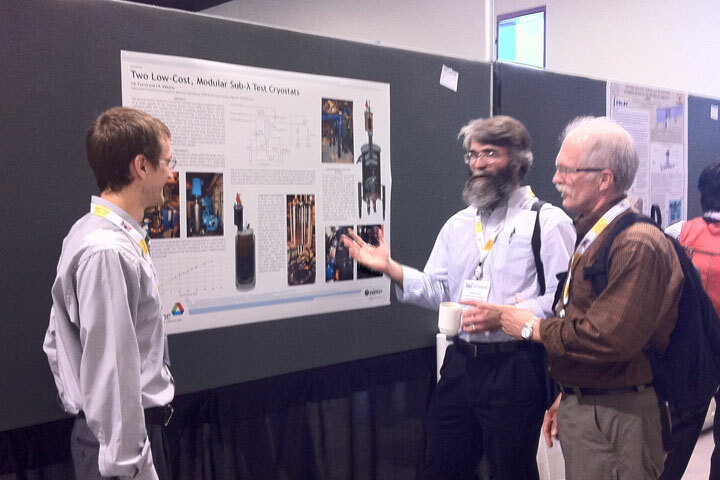 On Tuesday afternoon, Ed Bonnema presented our Meyer Tool poster, “Design and Fabrication Considerations for Stainless Steel Liquid Helium Jackets Surrounding SCRF Cavities”. 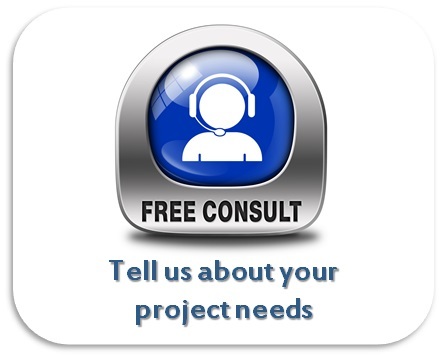 We’d like to especially thank Meyer project engineer Jake Rumel for his assistance on this. It was exciting to see the genuine interest the paper generated among the attendees. 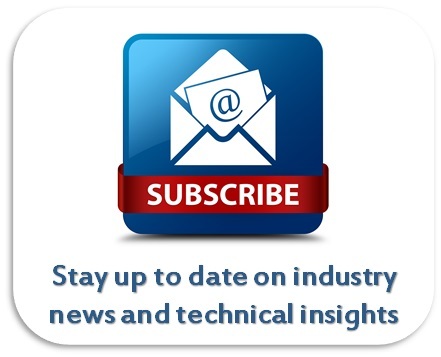 This topic has obviously struck a chord with those involved in navigating the ASME Code as it pertains to SCRF Cavity pressure boundaries. Our only regret is that we could not spend more time discussing the details within the limited time allowed. For those of you who missed the poster, the topic is discussed in this month’s technical article. 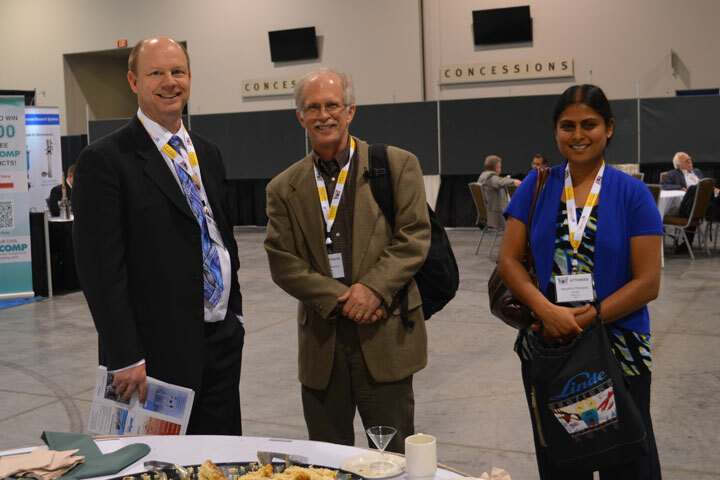 The Dena’ina Civic and Convention Center, in the heart of Anchorage, provided a great location for the conference, offering state-of-the art facilities against spectacular views and exposure to Alaskan culture. Many attendees, including Ed and Eileen, took advantage of the location and extended their trip, either on the front or back end, to include time for exploring areas beyond Anchorage city limits. Perhaps in appreciation of our admiration, Alaska responded with record warm temperatures and a streak of sunny days, allowing attendees ample opportunity to experience, unfettered by clouds or rain, the best of Alaskan natural beauty. 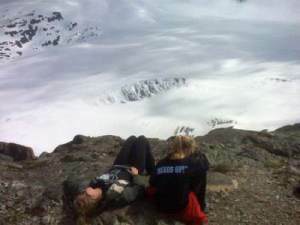 For example, while only 30% of Alaska visitors are treated to a view of the Great Denali, Mt. McKinley, both Ed and Eileen were able to view North America’s highest peak multiple times, capturing magnificent photos, as we are sure many other attendees did. Other sightseeing highlights included wildlife sightings such as bear and moose; cruises on Prince William Bay with views of otters, whales, eagles and its calving glaciers; the ski-lift up to Alyeska; fitness/adventure activities including hiking, ziplining, and flightseeing. For more photos of our Alaska trip please visit our Alaska photo gallery. 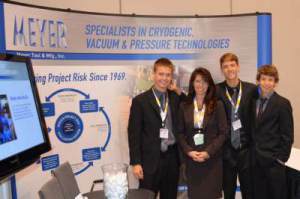 It’s been quite a few years since Meyer Tool successfully made our transition to second-generation leadership. We are proud to continue founder Frank Meyer’s legacy, providing Reduced Project Risk services to the next generation of projects, components and end users. Always looking to the long term, and in the spirit of continuity, Eileen’s sons, Eric, Eddie and Christian Cunningham made their conference debut at CEC. The older two, Eric and Eddie, have been working in the shop for the past few summers so, being in Alaska to enjoy other sights, stopping at CEC for their first conference experience was a natural choice. We know Frank is so proud of his grandsons. We are so glad we had the opportunity to catch up with our friends in the cryogenic community while experiencing America’s last frontier. The funding environment for many of our customers may be more of a challenge lately, but the spirit of science discovery and the camaraderie of this community continues to thrive.